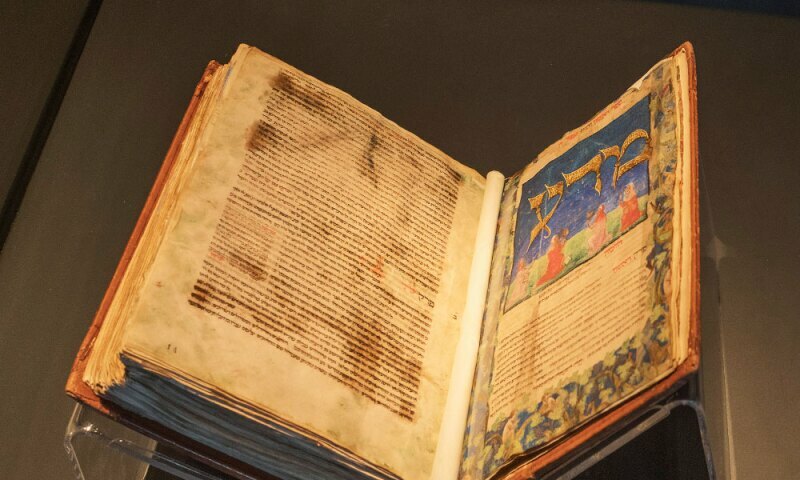 Mishneh Torah, Introduction and Books 1-5, Northern Italy, ca.1457, Handwritten on vellum; ink; tempera, gold and silver leaf, Biblioteca Apostolica Vaticana, Vatican City. Maimonides (Rabbi Moses ben Maimon, Cordoba 1138 – Fustat 1204) was a multifaceted personality – exegete and halakhic authority, philosopher, scientist, physician, and cross-culturally recognized Jewish leader. The illuminated manuscripts presented here, from diverse geocultural backgrounds, reflect the breadth and pervasiveness of his legacy. This exhibition will expose the visitor to a singularly rare item – Maimonides’s own signature – alongside a manuscript attributed to his own handwriting, one of his earliest works, on which he labored during his years of wandering, before settling in Egypt; his thoughts regarding the connection between Torah and science; and his aspirations to make halakha (Jewish law) as broadly accessible as possible. Maimonides became cognizant of the harsh contemporary predicaments of Jewish communities in Islamic lands and in Christian Europe while still in his youth. He personally experienced persecution in his native Andalusia and later in Morocco. From there his migrations continued to the Land of Israel, and finally Egypt. Fearing for the physical and spiritual survival of Jewish communities worldwide, and determined to effect the changes necessary to ensure their continuity, he produced three groundbreaking works: The Commentary on the Mishnah, the Mishneh Torah, and the Guide of the Perplexed. In addition to his extensive and systematic halakhic teachings – and many other subjects – his writings address basic issues such as the nature of the human soul, faith and the relationship between Man and God, and ethical conduct. They also offer practical advice regarding a proper lifestyle. Maimonides’s modes of thought and his concept of the Jewish religion were nothing short of revolutionary. Though some of his ideas were controversial, his writings were exhaustively studied. They remain relevant after more than 800 years.